A lot of people have asked if I’ve had any pregnancy cravings. I always laugh and if my husband is around he makes a face that says “I’ll tell you what cravings she has!” Because at the end of the day he can’t really say no when I point to this belly of mine and say “I reallllly want it though” while batting my eyes and trying to portray my cute face if there is such a thing. So donuts and ice cream is your answer. SO not good but SO good at the same time. The ice cream cravings are out of control. I want some every night. Always. The donuts — now that started when we moved back to MA. Because, ya know, Dunkin Donuts is just plain good. BUT there is also this fabulous little place right down by the beach that makes their own FRESH donuts every morning. If you aren’t there by 8:30am you’re lucky if you can snag a plain donut. So we make sure to get there niiiiiice and early and I usually sing the song on the drive cause it wouldn’t be a trip to Dockside Donuts without the song. My Dad made it up when I was little and it goes something like this: Dockside Donuts yaba daba daba daba, Dockside Donuts YABA DABA DABA DABA, Dockisde. DO NUTS! 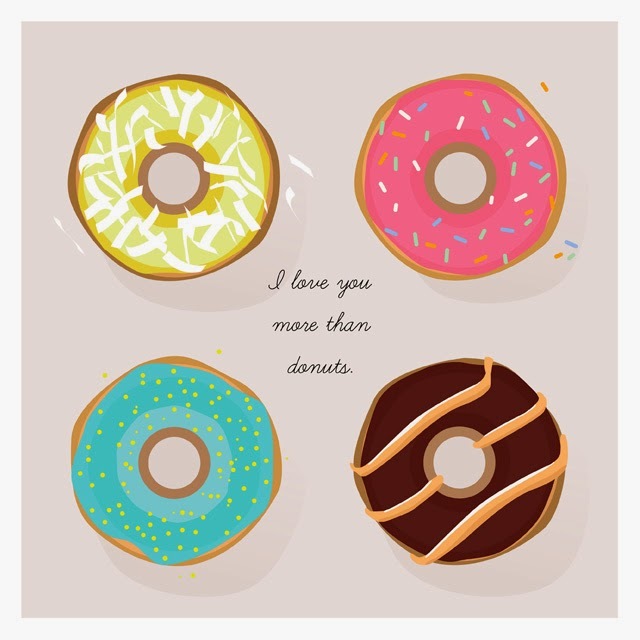 Needless to say I must tell my hubby often, I do, I love you more than donuts! Illustration by moi. Happy donut hunting.